Here is the final lesson, lesson 11. There is nothing new to memorize in this lesson. Lesson 11 gives a short overview of the @ symbol as well as the Morse abbreviations AR, SK, and DE. K Z D G O Y T H E Q U I C K B R O W N F O X J U M P E D O V E R T H E L A Z Y D 0 5 7 4 8 I 2 1 7 6 , F ? . / D E K E 4 G K P S A Y I N G 7 3 A N D T H A N K S .
I hope you enjoyed the course and have gained a basic capability in Morse Code! If you have any comments, suggestions, or questions, please feel free to leave them in the comments box! Thanks! Here is lesson 8 and the letters Y, J, L, and the number 4. Please leave any comments, suggestions, or questions in the comments box! Thanks! Here is lesson 7 of the Morse Code course. This lesson covers the letters P, C, Q, and the number 3. As always, feel free to leave any suggestions, comments, or questions in the comments box! Thanks! And here is lesson 5! This lesson covers the letters V, U, G, and the number 8. Have fun! As always, please feel free to leave any suggestions, comments, or questions in the comment box. Here is the 4th lesson in the International Morse Code course. This lesson covers the letters K, D, W, and the number 2. As always, if you have any comments, suggestions, or questions, please feel free to leave them in the comments box. Here is the 3rd lesson in the International Morse Code Course! This lesson covers the letters S, O, R, and the number 1. If you are feeling comfortable with what you've learned so far, it is time to move on to the next lesson. You should be able to copy the majority of the run sequences, only missing a few letters. Do not be worried about going back to previous lessons to review the letters. As always, be sure to leave any suggestions, comments, or questions in the comments box. Thanks! Here is lesson 2! In this lesson we cover the letters M, A, N, and the number 0. Be sure to copy down all the code you hear in the lessons! If you have trouble with a letter, don't hesitate to skip it and move on to the next letter. You can miss a lot of letters trying to remember the one letter you forgot. Also, don't hesitate to go back and review lessons with letters you have trouble with. The goal is to commit the code to your long term memory. You need to gauge your own learning style to determine how much you need to review. Do not expect to pick up everything presented in a lesson just from one listening. -The minimum wire size for a 20 ampere current is AWG #12. -The fuse you would want to install along AWG #14 wire is a 15 ampere fuse. -60 Hz alternating current is more dangerous to humans than direct current or RF energy. -The maximum amount of current that can run through a human body without causing damage is 50 microamperes. Here is lesson 34! This lesson primarily covers RF safety and Maximum Permissible Exposure (MPE) limits. RF energy can heat and damage bodily tissue. None of the material in this section is much of a stretch and most of the answers fall within "common sense." One thing I will recommend is to do a quick scan of the FCC OET Bulletin 65 which covers RF exposure limits and RF safety. There is one question that is a little out of the ordinary. When multiple transmitters are operating at a single site, the transmitters which are contributing more that 5% of the MPE limit are the ones responsible for ensuring RF safety compliance. The actual way this is determined is a little more complex than what the question seems to be asking. It is probably best just to memorize this one. One more lesson to go! As always, please feel free to leave any suggestions, comments, or questions in the comments box. Here is lesson 33 and the G9D section. This lesson goes over some aspects of specialized antennas. There are two antenna types you will need a basic understanding of: Log Periodic Antennas and Beverage Antennas. A log periodic antenna looks a lot like a type of Yagi antenna, but the log periodic antenna is capable of handling a much larger bandwidth than a Yagi. The elements of a log periodic antenna are basically a series of dipoles connected to each other along a boom. The longest element is cut to 1/2 wavelength of the lowest desired operating frequency. From there the length and spacing of the elements is determined by a logarithmic formula. Thus the "log" in log periodic antenna. A Beverage antenna is basically a very long wire. Beverage antennas are great for low HF directional receiving but are very bad for transmitting. Beverage antennas are characterized by their long length, low height above the Earth, and their ability to be very directional receiving antennas. They can be extremely long, miles in some cases. NVIS, or Near Vertical Incidence Skywave, is a term you will need to be familiar with as well. An NVIS antenna is a horizontally polarized antenna that is placed between 1/10 and 1/4 wavelength above the Earth. The result this has is that the majority of the signal strength is radiated more upward than off to the sides which allows for shorter skip distances during the day. The one and only number you need to memorize for this section is the gain of two 3 element vertically stacked Yagis 1/2 wavelength apart. By stacking Yagis in this fashion, the two Yagis will produce a 3 dB gain over just a single 3 element Yagi. Here is lesson 32 which deals with directional antennas. This lesson primarily works with three type of directional antennas: Yagis, Cubicle-Quads, and Delta-loops. The video for this lesson is long, but the information is relatively easy to absorb. 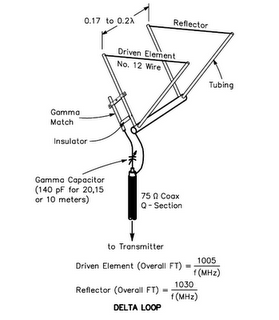 The basic Yagi antenna consists of three elements: The driven element, reflector element, and the director element. The driven element is the element that is connected to the feedline and thus the transceiver. The other elements are what are called "parasitic" elements and their function is to focus the signal to and from the driven element. By increasing the length of the Yagi and adding director elements, the gain of the Yagi is increased in the Yagi's focal direction. The length of a Yagi's driven element is generally 1/2 wavelength of the desired frequency. Cubical Quad antennas are the second directional antenna this section deals with. 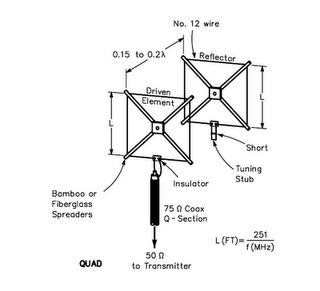 The basic quad antenna consists of a driven element and a reflector. Directive elements can be added to increase gain. The driven element of a quad antenna equals a full wavelength of the desired transmit frequency. Delta-loops are similar to quads except that they are triangular vice square. A few points to memorize: The gain of a 3 element Yagi, 2 element quad, and 2 element delta-loop are all about the same. The relative gain of a Yagi antenna in its focal direction is 9.7 dBi. And that's about it. As always, please leave any comments, suggestions, or questions in the comments box. Thanks! Here is lesson 31! Just four more to go! This lesson covers basic antennas. There are a few things you will need to remember for this section. Keep in mind that a 1/4 wave antenna is half the length of a 1/2 wave antenna and 234 is half of 468. That should help in memorizing the formula. There are also some feed-point impedance relationships to antenna construction that are not very intuitive and you will need to memorize. -For ground plane antennas (think vertical antennas), downward sloping radials increase feed-point impedance. -A dipole's feed-point impedance steadily decreases as the antenna is lowered below 1/4 wavelength above the Earth. -A dipole's feed-point impedance steadily increases as the feed-point (where the feedline attaches to the dipole) moves from the center to the ends of the antenna. As always, please feel free to leave any comments, suggestions, or questions in the comments box. -The characteristic impedance of feedline most often used in amateur radio is 50 and 75 ohms. -Flat ribbon TV type twin lead is 300 ohms. -Attenuation is the reduction in signal strength expressed in dB. When you see attenuation, think signal loss. -RF feedline loss is most often expressed in dB per 100 feet. -To find Standing Wave Ratio (SWR) when all the impedances are known, simply divide the larger impedance by the small impedance. SWR is expressed with the larger number first with the second number always reduced to 1. For instance: 4:1, 3:1, and 2:1. It is not expressed 1:4, 1:3, 2:1.5, etc. That's about it for this lesson. As always, feel free to leave any comments, suggestions, or questions in the comments box! Hello again! The majority of lesson 29 deals with things we've covered in previous lessons. The majority of this section deals with mixer and multiplier stages, deviation, and bandwidth. There is also a little on data modes as well. Mixers are stages in transmitters and receivers which combine two frequencies to produce a third. This process is called heterodyning (remember the super heterodyne receivers we talked about in previous lessons). When two signals are combined in a mixer, the new frequency will either be the sum or the difference of the two combined frequencies. For instance, if a 10 MHz signal is received by an antenna is sent to a mixer and combined with an 8 MHz signal produced by an oscillator, the result will be an intermediate frequency (IF) of either 18 MHz or 2 MHz (10 MHz + 8 MHz or 10 MHz - 8 MHz). The process to determine whether the IF is the sum or difference is fairly complicated and not important for the purposes of passing the exam. The important things to know about mixers are they combine, or mix, two different frequency to produce a new frequency for the purposes of producing an IF or a desired transmitting frequency. Multipliers perform a similar function as mixers in that they take an input signal and produce a new signal at a different frequency. The difference is that a multiplier produces the new frequency by generating the harmonic of the input frequency. This new frequency is usually double the input frequency. For instance, if a 10 MHz signal is sent to the multiplier, the output frequency will be 20 MHz. Multipliers are often used in VHF FM transmitters to change a modulated HF signal to a frequency in the VHF range. These signals are often sent through several multiplier stages, doubling the frequency each time, until the desired transmitting frequency is reached. The key word to remember when dealing with multipliers is "harmonic". Another concept which may require some explanation is deviation. Deviation primarily deals with FM signals. A very simple explanation of deviation is that it is the difference between a carrier signal and frequency modulated signal, or the frequency differences between the modulated signal and the original carrier wave. Deviation is expressed in terms of frequency (kHz, MHz, etc.). For this section of questions, the thing to remember is that when a FM signal is sent through a multiplier, there is more or less a direct relationship between the signal frequency and the deviation. If the frequency doubles, so does the deviation. Please leave any comments, suggestions, or questions in the comment box. Lesson 26 is a big one. There are 24 questions to cover. Some of them get fairly deep. Others are simple Technician Class review. 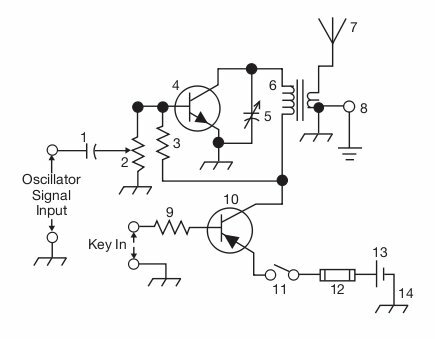 This lesson covers circuits and schematic symbols. The majority of the questions are review from the Technician Class exam, but the manner in which they are phrased can throw a wrench into the works. The first big subject you will to know for this section is the process in a single-sideband phone transmitter. This is not as hard as you may think. I did up a quick graphic to help. A few things to remember: A single-sideband signal is a type of amplitude modulated (AM) signal. A complete AM signal consists of a carrier signal and two side-band signals, one above and one below the carrier wave frequency. To make a change the AM signal into a SSB signal, the carrier and one of the side-bands need to be filtered off. 1) Carrier wave oscillator: A carrier wave oscillator generates a generic signal at a certain frequency. For our purposes, the carrier frequency does not matter. It is determined by the desired transmit frequency range, filtering in the transmitter, and the mode of the transmitter. There is no information on the carrier wave. It is just a signal at a certain frequency. Think of the carrier as a blank canvas. 2) Balanced Modulator: If the carrier wave is the blank canvas, the balanced modulator is where it gets painted. The balanced modulator combines the carrier wave from the carrier wave oscillator with a the audio signal from the microphone. The end result is a standard AM signal modulated with the voice information on it. Remember, the AM signal consists of the carrier signal and two side-bands. The carrier signal is stripped in the balanced modulator so the product is just the two sidebands. This signal's frequency is most likely not at the desired transmit frequency of the transmitter. 4) Mixer: The mixer is where the signal's frequency is changed to the desired transmit frequency. The mixer combines the single-sideband signal with a new signal produced by an oscillator. The result of this mixing is the signal's frequency is changed to the desired transmit frequency. 5) Amplifier: The signal is sent from the mixer to the amplifier where the signal's power is beefed up and then sent to the antenna. Carrier wave oscillator to balanced modulator, to filter, to mixer, to amplifier, to antenna...no problem. You will also need to know the process for a superheterodyne receiver. Here is Figure T6 from the Technician exam. Remember, the basic skeleton of a superhet receiver is an oscillator, mixer, and product detector. Filters and amplifiers just add to the basic receiver's performance. The big function of a superhet receiver is that the receiver produces an intermediate frequency (IF) to ease processing and filtering the incoming signal. 1) The signal is received by the antenna and sent to the Mixer. Sometimes there is an amplifier between the antenna and the mixer to aid in beefing up the received signal for processing. The mixer combines the incoming signal with one produced by an oscillator. The combining of these two signals produces an intermediate frequency (IF) which can further be filtered to improve the output quality. 2) In Figure T6, the IF signal is sent to an IF amplifier. The choice of where to put the amplifier in Figure T6 was after the mixer vice before. There are advantages and disadvantages to this which are not important for the purposes of the exam. This block could have easily been an IF filter, or an IF filter could have been added in addition to the IF amplifier. The point is that there is something that is processing the IF signal produced by the mixer/oscillator combination before it is sent to the product detector. 3) Block 1 in Figure T6 is a Product Detector. The product detector combines the IF with another signal from the Beat Frequency Oscillator, similar to the mixer/oscillator process previously. The resulting new frequency is an Audio Frequency (AF). This demodulates the IF into a frequency range which, when fed into a speaker, produces understandable sounds (like your voice). 4) The AF is then fed into an audio amplifier to beef up the AF's power prior to going to the speaker. A Direct Conversion receiver is a type of heterodyne receiver. The main difference between a direct conversion receiver and a superhet is there is no IF produced in a direct conversion receiver. The signal goes from the antenna to the mixer/oscillator combination where it is converted directly into AF. For an FM receiver, the discriminator performs the same function in demodulating the signal as the product detector does in the SSB superhet receiver. When you see "discriminator" think FM. A Bleeder Resistor helps dissipate the electric field in a power supply capacitor. Power supply filter networks usually consist of a network of capacitors and inductors. The minimum peak inverse voltage of a rectifier in a Full-wave or Half-wave power supply should be twice the peak output voltage of the power supply. Below is figure G7-1. It should help with the schematic symbol portion of the quiz. As always, if you have any questions, suggestions, or comments, please feel free to leave them in the comments box! In this lesson, we go over integrated circuits (ICs). This lesson is fairly straight forward, except there are a few definitions that you will need to memorize. If you remember from the Technician Class exam, Integrated Circuits are semiconductor devices with transistors, diodes, and other electrical components all on a single chip. They have revolutionized technology by essentially taking and entire circuit and placing it on a very, very small chip. -Linear Voltage Regulators are most often provided as an ANALOG IC. -CMOS stands for Complementary Metal-oxide Semiconductor and is the most common family of logic circuits. They use very little power compared to other ICs. -Operational Amplifiers (OpAmps) are ANALOG ICs. -MMIC stands for Monolithic Microwave Integrated Circuit. Please feel free to leave any comments, suggestions, or questions in the comments box. Stand by for lesson 26...it's a big one. Here is the 24th lesson in the General Class series. This lesson goes over the G6B section from the question pool dealing with a wide spectrum of stuff, from batteries to vacuum tubes. There is no real rhyme or reason behind the questions however, some of them are a bit deep. You may want to go over the video a couple of times to make sure you've absorbed the information. Peak inverse voltage is the maximum voltage a rectifier (diode) can handle before it will allow current in the non-conducting direction. Remember, a rectifier is, for the most part, a diode that only allows current to flow in one direction. A rectifier will block current in the non-conductive direction up until the voltage increases to a point where it will overcome the rectifier's ability to block the current. The maximum voltage a rectifier will block before it breaks down is the peak inverse voltage. Junction threshold voltage is another one you will need to know. Semiconductors are not great conductors, but they're not great insulators either. It takes a little more push than usual to get current to flow across the semiconductor material. This minimum voltage required to push current across a semiconductor is the junction threshold voltage. The junction threshold voltage is different for each type of semiconductor material. The junction threshold voltage for a germanium diode is 0.3 volts. For a silicon diode it is 0.7 volts. A Schottky diode is a diode that has a piece of gold or platinum added to it which helps disperse the capacitance which builds up across the PN junction. A vacuum tube has a screen grid placed between its grid and plate to disperse the capacitance that builds up between those two parts. Vacuum tubes and transistors have some functional parallels. The example that is brought up in the exam questions is the common functions between a vacuum tube and a Field Effect Transistor (FET). Each have three leads. A triode vacuum tube has the cathode, grid, and plate. A FET has the source, drain, and gate. The gate on a FET and the grid on a triode vacuum tube serve roughly the same purpose in controlling current flow through the component. The other deep question in this section is the regions of a bipolar transistor. The three regions you need to know are the cut-off region, the saturation region, and active region. The transistor's region is determined by the polarity and amount of voltage applied to the various leads. What you need to now for the exam is the cut-off region does not allow any current to flow through the transistor. The saturation region allows current to flow freely through the transistor. The active region is somewhere in between. When the transistor is acting as a switch, you only want the transistor to work in the cut-off (off) and the saturation (on) regions. Finally there's a bit about batteries. Nickel Cadmium (NiCad) batteries have high discharge current. Carbon-zinc batteries are disposable and should never be recharged. Nickel Metal Hydride (NiMH) batteries are rechargeable. Like I said, this lesson is all over the place. If you have any questions, comments, or suggestions, please feel free to leave them in the comments box. Here is lesson 22 and some math for hams. This lesson mostly covers how to calculate total resistance, capacitance, and inductance in a circuit. The formulas you need to know are below. You may want a calculator for this lesson. Magnetizing current is the current in the primary winding when no load is attached to the secondary winding. Total inductance and resistance in a circuit are calculated in the same manner for components in series and in parallel. Total capacitance is calculate in the opposite manner. To find the voltage across the secondary winding in a transformer divide the volts AC connected to the primary winding by the ratio of primary turns to secondary turns. Good luck. As you will probably notice, I'm not a math teacher! If you have any suggestions, questions, or comments, please feel free to leave them in the comments box. Hello again! Here is lesson 20 and the G5A questions from the exam question pool. This lesson deals with impedance, reactance, and resistance. A lot of the time impedance is associated with antennas and antenna matching. Impedance is much more broad of a topic. Impedance matching is important to maximize the transfer of power. The more closely the impedance is matched between the power source and the load, the more efficient the transfer of power is. For the purposes of the exam, impedance is the opposition to current flow in an AC circuit. Resistance and reactance are both types of impedance. Reactance is the other new term in this lesson. Reactance is the opposition to the flow of current in an AC circuit caused by capacitance and/or inductance. The electric field created by capacitors and the magnetic field created by inductors react to the constant reversal of current direction in AC circuits. As the frequency of the AC current increases, the reactance (or opposition of current flow) caused by inductors increases. For inductors, the higher the AC frequency, the higher the reactance. Capacitors are just the opposite, The higher the AC frequency, the lower the reactance caused by the capacitor. Impedance, reactance, and resistance are all measured in Ohms. If you have any suggestions, comments, or questions, please feel free to leave them in the comments box. Thanks!